Well, it's about as simple as it sounds. You can target your ads based on a topic. The best part, at least in my opinion, is you can target as narrowed down to a specific sub-topic for every ad group. If your account is well structured, each campaign and each ad group has it's own purpose. There is some overlap, but you can target multiple subjects and the subjects are not limited to using in only 1 category. For example, you may have a doctors office and your AdWords campaigns are separated by patient type. Therefore, you likely have an ad group related to pediatrics...you can target that ad group to a pediatric topic. The benefit? Your ads, if well written, will be related to pediatrics. Make sense? If it doesn't make sense, think of it like this...the more targeted and specific your ads are in relation to what the end user is looking for, the higher your click-through-rate will be. At the same time, if your landing page and ad are closely related and your landing page is well structured, you will have a higher conversion rate. The more specific you can target your ads, the better your ads will perform. Login to your account at http://adwords.google.com. Unfortunately, topic targeting is not yet available from the AdWords Editor. Navigate to your Campaigns tab. Directly above the graph of recent performance you should see several tabs, one of them may be Topics. If you don't see a topics tab, click the drop down arrow to the far right of the tabs. In this drop down you should see the option for Topics (Display Network Only). Click the check box and you should start seeing the tab for Topics. 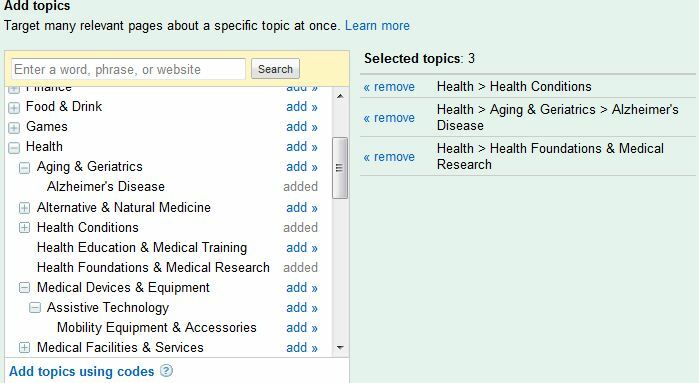 If you click the Topics tab, just below the graph you will have the option to add a new topic by pressing the +Topic button. You will first select a campaign, then an ad group. You cannot topic target by campaign only, it must be by ad group. Once you choose the ad group you can start adding an unlimited number of topics. Any topic that has a plus beside it can be narrowed further, if you add a topic with a plus beside it, you will in-turn add all sub-topics. After you finish adding all topics be sure to save! You will then see a populated list of all topics you will be targeting as well as associated CPC, Clicks, Impresssions, etc. Your max CPC will be based on your display network CPC bids. That's it! If you have a substantially large account it can take some time to go through and add specific topics for each ad group, but it should be worth it in the long run.